The previous elements will have seen you learning practical training and theory off-road at your training site. Element D is classroom based theory and will prepare you for final the on-road element. Element D will last for around 45 minutes and will further your knowledge on legal and safety aspects of riding a motorcycle on public roads. 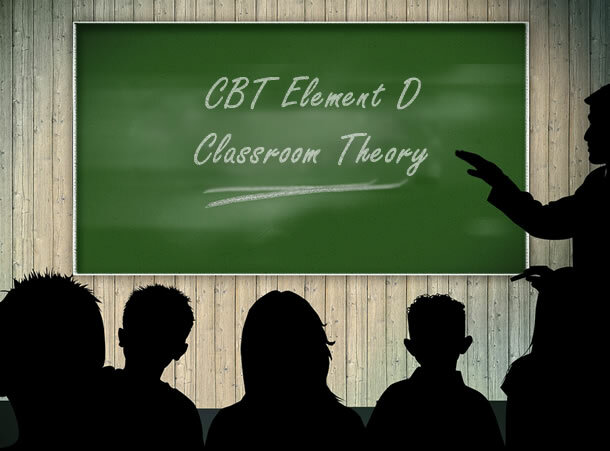 Detailed in this section are the various topics you can expect to cover with your trainer in the classroom-theory based element D.
You will have already covered some of the legalities involved with riding a motorcycle on public roads at the beginning of the CBT course. Your trainer will run the provisional motorcycle entitlements and motorcycle legal requirements such as insurance, tax and MOT testing. Other legal requirements discussed are safety helmets and displaying L-plates as a learner rider. The Highway Code is a reference in paper book or digital format that all road users must read. When applying for a provisional licence, you will have agreed and signed confirming that you have read the Highway Code. You’ll be expected to have a reasonable level of knowledge on the rules of the road before attending your CBT. Defensive driving is a skill that enables you to see potential hazards and developing hazards well in advance and to take appropriate action. Defensive driving requires constant concentration and riding skills including road positioning, safe, appropriate speed and awareness and anticipation. Your trainer will explain defensive driving and provide examples. Many of us know the dangers of riding too fast. Your trainer will explain why it’s important to ride within the legal speed limits and at an appropriate speed for the traffic, road and weather conditions. You’ll also have an explanation of the danger or riding too slowly and how it can affect other road users. The safest road position for a motorcyclists is around the centre of your side of the road. Riding too close to the kerb or too close to the centre of the road can prove hazardous. Your trainer will cover this along with the correct road position for bends and junctions. Forward planning is essential as you’ll need to avoid hazards such as drain covers and manhole covers. The two second rule is a simple system used by many motorists to gauge a safe following distance in varied weather conditions. The two second rule will be discussed by your trainer. Rain can substantially change the level of grip your tyres have on a particular surface and your trainer will explain those road surfaces that are best avoided if possible, such as painted road markings and drain covers. Your trainer will discuss the importance of forward planning and the ability to see these potential hazards in advance. Advice will include spotting hazards such as the rainbow effect that diesel or oil spillage can have on a road surface in wet weather and how the various surfaces affect braking, accelerating and cornering. Riding competitively or aggressively significantly increases your risk of an accident. Try to remain calm and focused even when other motorists make mistakes. To ensure you remain legal and as safe as is possible, it’s best to never drink and ride, even if it’s within the legal limits. CBT element D will cover the legal limits of alcohol whilst riding within England, Scotland and Wales and that this limit varies on countries around the world. You’ll discus how alcohol and drugs affect your concentration and how it slows your reaction times and balance. You’ll cover also how long they can remain in your body.